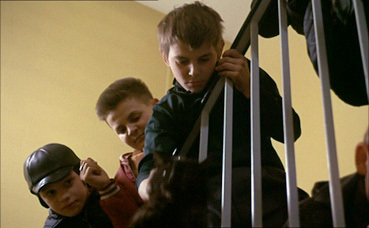 There's a strong likelihood that animal lovers are going to have a bit of a problem with an early scene in Maurice Pialat's compelling debut feature L'Enfance-nue [The Naked Childhood], in which a small group of young boys watch in amusement as one of them, François, dangles a cat over a balcony and then drops it down several flights of stairs. It's not done for real, you'll doubtless be relieved to know, but the act itself is still likely to prompt a reaction (there's no way I'd show this scene to my girlfriend, who would develop immediate narrative expectations that the kids should all pay with their lives), but it establishes early on that the film's depiction of childhood is going to be direct and unsentimental. No explanation is provided for François' actions, which seem all the more inexplicable when you realise that the animal belongs to his younger sister Josette, or at least that's how it first seems. Only through conversations and encounters that follow do we learn that François has been placed in foster care with Josette's family and that he has been forcibly separated from his parents by social services for unspecified reasons. This may not excuse his behaviour, but it does throw some light on his state of mind. L'Enfance-nue is not a drama constructed around traditional narrative arcs, but a study of character and situation. It's not a documentary but at times feels almost like one, thanks the unforced naturalism created by Pialat's improvisational approach, soupled with performances from a largely non-professional cast that are so free of artificiality I'd be tempted to describe them as non-performances, were it not for the misleadingly negative connotations the term carries. The effect is completed by the absence of a music score and Claude Beausoleil's unobtrusively observational camerawork, much of which is hand-held but mercifully free of that now obligatory "look at me, I'm immediate!" waggle of post-Dogme TV and film drama. 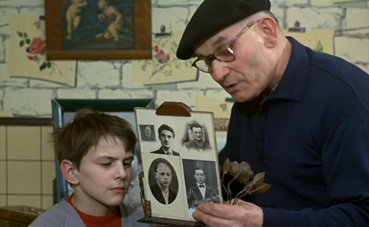 Such an approach forges a bond of empathy with François and the lack of stability or permanence to any aspect of his life, as he is taken from one family and placed with another and expected to instantly accept his new surroundings and hosts and the rules by which they live their more settled lives. In elderly couple Minguet and his wife (real-life foster parents Michel and Marie-Louise Thierry, who inspired the film and are effectively playing themselves), with whom he resides for the second half of the film, François appears to find a degree of stability. Their blend of no-nonsense discipline and tolerant understanding weathers an early conflict that sees François kick his way through the door of a room in which he is locked, but the following day assist Minguet with its repair and listen with interest to his stories. That he strikes up an uneasy friendship with the older Raoul, also in care under the couple's guardianship, is both logical and inevitable – more surprising is the considerable bond he forms with Mémère (enchantingly played by Marie Marc), the couple's elderly and often bed-ridden mother. It's typical of the instability of François' life that this is not destined to last, and her later passing can't help but feel like fate has opened a door of hope and opportunity for him and then slammed it squarely in his face. Inevitably the film recalls François Truffaut's justifiably celebrated debut feature Les Quatre cents coups [The 400 Blows] (1958), which also explored in naturalistic and semi-autobiographical fashion how a troubled young boy's life can be negatively shaped by the system and likewise featured an enigmatic young non-professional in the lead role. The unfortunate side effect of this has seen L'Enfance-nue used by some as a weapon in the sport of retrospective Truffaut bashing, with claims made that the earlier work is now overrated and seriously inferior to Pialat's. But there's almost a decade between the two films, and remarkable though L'Enfance-nue may be, Les Quatre cents coups genuinely broke new ground in its day and in a manner that helped pave the way for filmmakers like Pialat to walk his own distinctive if thematically similar path. That Truffaut was one of this film's producers only serves to cement the connection. None of which should detract one iota from the quietly compelling power of L'Enfance-nue. It's central issue of a young boy whose rebellious and even anti-social behaviour is rooted in part to a lack of permanence, parental guidance and a solid emotional connection with anyone around him is one that still sparks heated debate 40 years on, which together with the low key documentary realism and waste-free editing of Pialat's approach give the film a freshness that belies its age. A hugely impressive work in its own right, for a first feature – and at 43 Pialat will be seen by many as something of a directorial latecomer – it is genuinely remarkable. The 1.66:1 anamorphic transfer from a French restoration is excellent, boasting a flawless contrast range, strong colour and a richness that you only seemed to get with pre-1970 35mm features. Film grain is visible but not an issue, and the print itself is spotless. One shot later in the film flickers noticeably, but it doesn't last long. The mono 2.0 soundtrack is clear, through there's no music score to really test the dynamic range. There's some minor fluffiness to odd bits of dialogue, and a slight hum in places that can be accentuated by the subwoofer if you're redirecting the bass through it, which can be cured by forcing the sound to 2-channel. As it should be, of course. This is a 2-disc set and the extra features are split over both DVDs. A brief but useful interview with co-scriptwriter and editor Langmann and Pialat collaborator Grandperret, who reveal some interesting aspects of Pialat's personality and talk about the script, the contribution of the performers, and the importance of Truffaut's trust in getting the film made. 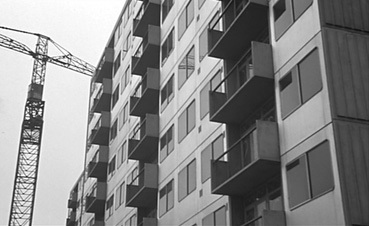 It's easy to see why Truffaut was so captivated by Pialat's debut short, a wonderfully written – tower blocks are described as "civilian barracks, concentration camps payable in installments" – and captivatingly assembled film essay on the changing face of suburban Paris, the plight of the working class, and the loss of culture and green space to increasing urbanisation. Fabulously shot in black and white by Gilbert Sarthre, scored by the insanely prolific Georges Delerue and driven forward at some speed by Kenout Peltier's brisk editing, it has the sort of serious-toned voice-over the French seem to specialise in. The transfer is non-anamorphic 1.66:1 and is in fine shape. Reasonably captures the film's flavour and is in excellent shape. A 1969 television documentary directed by Francis Warin and Daniel Creuset and edited by Arlette Langmann that starts with the best opening credits sequence I've come across in years, as the names and jobs of the crew are verbally related to an official who is presumably challenging the crew's presence at one of the locations. What follows is an essential companion to L'Enfance-nue that explores not just the film but the foster care experience from the viewpoint of both the children and their temporary guardians. The most revealing interviews are with the Thierrys, the couple who inspired the film and play François' foster parents, and young Didier, who was the direct model for François, right down to his difficult behaviour and conflicts with the couple he now regards and his true parents. An excellent inclusion. An interview with the director conducted in 1973 by Michel Martens from the French television programme Champ contre-champ [Shot Reverse-Shot]. If you can put aside Martens' unfortunate visual resemblance to that annoying office guy in The Fast Show, this is another fascinating companion piece to the film in which Pialat is asked up front to account for the film's box-office failure, to which he engaging responds that given the option even he probably wouldn't have gone to see it at the cinema, and that had it been a success its TV screening would have been on a major channel, not this one. Although Pialat is effectively put on the defensive from the off, he acquits himself well, discussing the influence of critics, other filmmakers' lack of bravery, and the reasons for continuing making films for a living even when things don't go as you'd hoped. Although a videotape recording, the transfer quality is very good, save for a touch of tape damage at the start. An interview, conducted in 2005, with the lead actor of L'Enfance-nue, who 37 years on looks back at the experience of playing young François. Particularly interesting are his recollections of having to improvise at the age of 10, his interpretation of the character, and the sometimes temperamental nature of the director. The picture is anamorphic widescreen and looks fine. An interesting peek at some of Pialat's other work, the trailers are for Nous ne vieillirons pas ensemble (1972 – 3:42), La Gueule ouverte (1974 – 2:50), Passe ton bac d'abord (1978 – 2:15), A Nos amours (1983 – 1:24), Police (1985 – 1:29) and Sous le soleil de Satan (1997 – 3:24). All are in good shape and most are anamorphic. At the time of writing I've yet to see the accompanying booklet, which I presume will be of the usual high standard. The review will be updated when we I have this. A compelling and impeccably made first feature given superb treatment by Masters of Cinema, the excellent transfer backed up by a comprehensive collection of extra features that really do expand your appreciation of the film, the issues it touches on and those involved in its production. Highly recommended.